VietNamNet Bridge – ‘Toba Mika – Scenes remaining forever in one’s soul’ opened on Thursday, Nov 21, at the HCMC Museum of Fine Arts in downtown HCMC, as part of the 40th anniversary of Vietnam–Japan diplomatic ties and the Vietnam–Japan Friendship Year 2013. 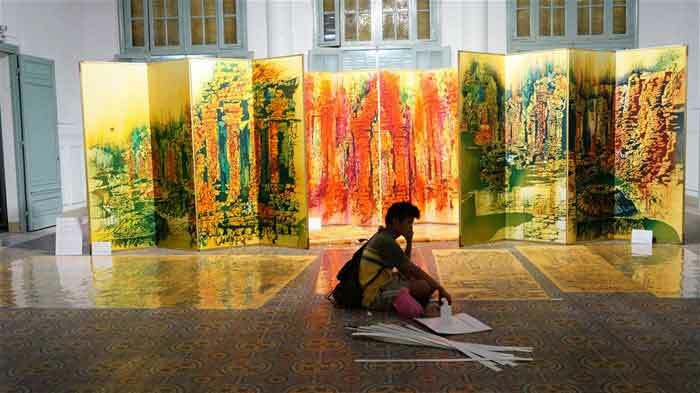 A member of staff sits near works of Japanese artist Toba Mika after arranging the paintings for the exhibition ‘Toba Mika – Scenes remaining forever in one’s soul’ at HCMC Fine Arts Museum. On show at the painting exhibition are 31 large works depicting sceneries through Vietnam in places the artist Toba Mika has graced from southern, central and northern parts with many highlighted cultural and historical heritage sites. In the show, guests will be taken on a journey in Hue with a romantic view of Huong River, ancient giant tree lines and magnificent royal palaces. Meanwhile, Hanoi is seen through the old quarters blanked with the fragrance of milk flowers and busy life by French colonial buildings and narrow streets. HCMC is depicted in another light after the rain with tranquil corners away from the bustling scene of rows of vehicles along canals and a peaceful atmosphere where rainbows come over the bridge after the rain. Quang Tri is peaceful with the image of an old cathedral with sounds of carols, golden sun rays shining on small streams nearby the church recalling old pains of the past. Danang is striking with fishing villages on Han River while at My Son Sanctuary the vestiges of time are presented in the Cham towers. Toba Mika is a regular visitor to Vietnam where she discovered an eventful life, interesting contradictions and flexible moves that take her back to Japan of the 1960s. She is attracted to and inspired by landscapes, colorful rivers, beaches and even street corners and trees. To make the works, she uses a traditional Japanese dyeing technique called katazome which uses a resistant paste applied through a stencil. Born in Aichi Prefecture and graduating from Kyoto City University of Arts (M.A.) she has brought in katazome, a traditional dyeing method in Japan, to the world of painting, and has created new contemporary art. She has won 19 prizes including Kyoto Arts New Artist Prize and Urban Culture Incentive Award. The exhibition will run until December 15 at the museum, 97 Pho Duc Chinh Street, District 1.